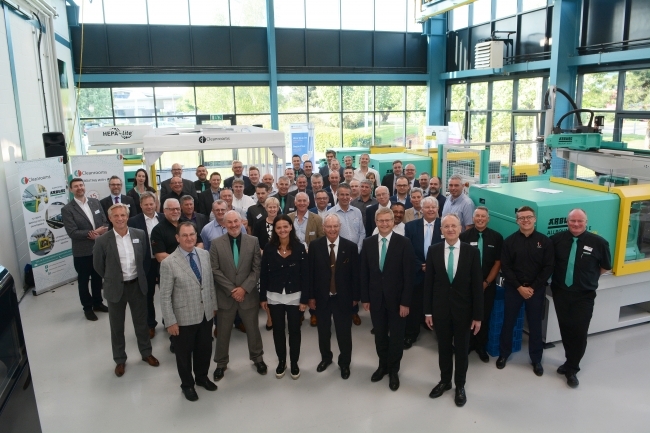 Over 90 customers from across the UK and Ireland met together with senior management and members of the Hehl family to celebrate ARBURG Ltd.’s 25th birthday in Warwick in May. 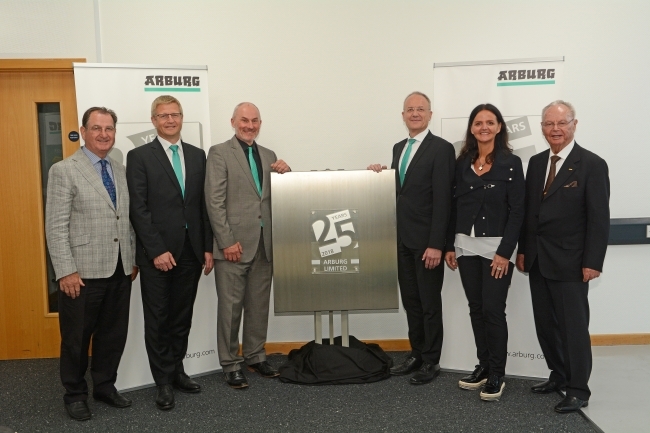 Customers and employees gathered to celebrate the UK subsidiary’s silver jubilee, which was also attended by Gerhard Boehm, Managing Director Sales Worldwide and Sales Director Europe, Stephan Doehler. Alspirbach German beer – local to ARBURG’s home in the Black Forest – Bratwurst and pickles and an Industry 4.0 technology demonstration direct from the Hannover Fair brought an aptly German-flavour to the party for the company that started life as Hahn & Kolb in Rugby in the 1960s and moved to the current site in 1999. The Warwick-based showroom was packed with demonstration machines and exhibitions from several ARBURG Ltd. partners, including a cleanroom demo from Connect2Cleanrooms, and ancillary solutions supplier TH Plastics. One demonstration which caused great interest was an ARBURG ALLROUNDER 375V 500 100 vertical machine showing an “Industry 4.0” manufacturing cell, producing mixed elasticated cords where the customer could select varying end pieces and cord lengths from a central panel in any combination every cycle. The first Allrounder in the UK was sold to RA Labone in 1967. In 1973, the company’s predecessor Hahn & Kolb was established as the UK distributor for ARBURG. The company became ARBURG Ltd. in 1993 and in 1998, construction began on the current Tachbrook Drive site, completed on 2 March 1999. The new building was opened by her Royal Highness Princess Anne, which, Mr Boehm said, underlined the importance of ARBURG in the UK. Today, ARBURG is preparing for the future, Mr Boehm said. As well as the annual Technology Days openhouse in Lossburg, the company has annual training days, an apprentice exchange programme with customers and is investing more in Industry 4.0- enabled control systems and more robotic systems to increase productivity. Managing Partner Julianne Hehl said she was highly impressed with the UK subsidiary. She said the company motto “WIR SIND DA”, loosely translated as “We are there”, is kept in the German language to cover ARBURG’s philosophy of being there for customers worldwide, all the time, while showing pride that all the machines are made in Lossburg, Germany. Colin Tirel took the guests through “A journey through 25 years”, showing major production introductions down the years such as the first SELOGICA control in 1993, the first ALLROUNDER E in 1995 and larger clamping force machines, the 630 S and 720 S, in 2001. The UK subsidiary attended its first Interplas show in 1993 before moving to the new site in 1999. There were many other land marks including the introduction of GOLDEN Edition range in 2006 that marked 50-years of manufacturing injection moulding machines. Punctuating the UK subsidiary’s history, Mr Tirel showed parallel developments at Lossburg, including the new customer centre in 2009 and expansion to the manufacturing facility in Lossburg. Further successes for ARBURG Ltd was secured at the UK Plastic Industry Awards – in 2012 with John Guest, Harwin Ltd in 2013 and start-up company GripIt Fixing’s in 2015. Looking to the future, Colin noted excitement around the new 650 tonne clamping force 1120 H machine and innovations in Industry 4.0 technology in the area of condition monitoring in ARBURG equipment. “Under the heading of smart machine we are introducing more equipment that can monitor and pre-diagnose technical issues as they occur, leading to faster diagnosis” he said.